Feeling the winter blues? While it is common to experience a little bit of a letdown when the daylight hours get shorter in the fall and winter months, for some people it becomes a persistent depression that lasts for days, with symptoms that include fatigue, crying spells, body aches, irritability, loss of interest in activities, and more. 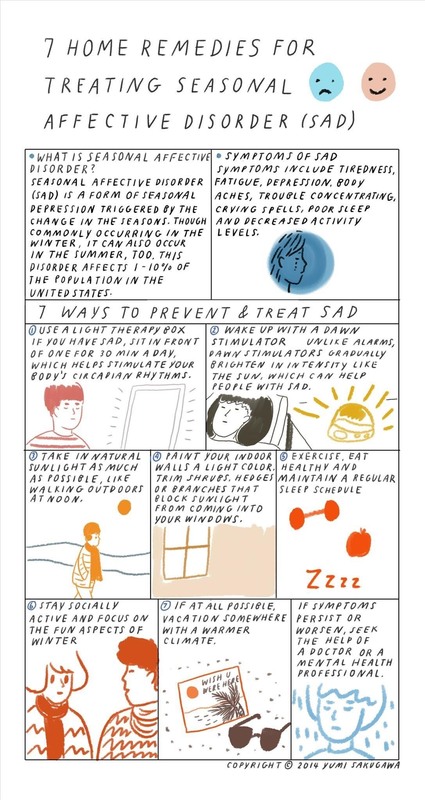 If you think you have seasonal affective disorder (SAD), you are not alone; SAD affects about 1 to 10 percent of the adult population in the United States. Luckily, it can be treated on your own with the help of a light therapy box, spending more time outdoors in sunlight, exercising regularly, and maintaining a regular sleep schedule. If symptoms persist, seek the help of a medical professional.